A bargain, says dictionary.com is “an advantageous purchase, especially one acquired at less than the usual cost.” The problem with this definition as far as wine is concerned is that bargains are generally obtained by bargaining, e.g. haggling, and such negotiations do not take place at your neighborhood wine shop. So how do you decide what’s a bargain in wine? 1) You look at the price. 2) You look at the score. Only it probably isn’t. It’s probably swill, which is why it’s being dumped. I think you find real bargains by knowing the track record of the winery, and by having a reviewer, or publication, or blog or shop clerk or friend whose palate evaluations you have come to trust. 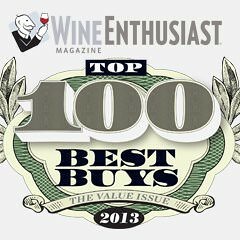 Wine Enthusiast Tasting Panel members are all specialists, assigned to specific regions. You can easily follow any of us by going online here. You can search by variety, region, producer, Best Buys, Editors’ Choices, etc. Best Buys top out at $15, but some bargains are priced a little higher, yet still punch way above their weight class. Here’s what’s been in my own bargain bin during the past few weeks. Full retail prices are listed; you can often find these wines for less. The softly floral scents of rose petals and body powder introduce this excellent wine, followed by bright flavors of Meyer lemon and pink grapefruit. The 2% residual sugar is complemented with zippy acids, keeping this well-crafted wine off-dry but not sweet. Bright, semi-tropical fruits are set in a frame of lusciously toasty oak, with highlights of roasted almonds and a bit of butter. Firm and substantial, with excellent depth. Updraft is two thirds Sauvignon Blanc and one third Semillon, barrel-fermented. Full-bodied and fleshy, it’s bursting with ripe yellow fruits, along with apricot and papaya. Definitely on the tropical edge, but focused and lightly toasty, as in Bordeaux. This lovely blend of Sauvignon Blanc and 14% Roussanne is as crisp and fresh as its name implies. Bright fruit flavors of lemon, lime, orange and pineapple speak to the success of this unusual blend. Erath quite possibly makes more Pinot Blanc than anyone in Oregon, if not the entire country. Detailed, fruit-driven and complex, it’s loaded with apple, pear and peach fruits, buoyed by firm acidity and finished with a hint of almonds. Stone fruits, hints of tropical papaya and banana also, contribute to a complex, fruit-driven, well-balanced wine with medium-term aging potential. This shows Kabinett-level sugar (4.6%) and alcohol (8.7%), keeping the wine poised with moderate acidity and a soft, elegant entry. Flavors of oranges and peaches are underscored with light minerality, and despite its overall simplicity, the wine persists generously. This is a seriously good wine, worthy of special attention. It could be mistaken for a particularly fine country wine from Italy, southern France or Spain, with its old vine complexity, red and blue fruits, and whiff of tanned leather. It’s tough to find a Walla Walla wine at this price with this much concentration and power. In the mouth it has a plush, soft appeal, with a lush mix of fruits and generous barrel flavors of chocolate and baking spices. Roughly two thirds Merlot, one third Cabernet Sauvignon, this is the finest O•S Red since the 2007. Dark fruits abound, soaked in flavors of espresso, cedar, licorice and clove. It’s a splendid wine for the price, one to buy by the case. It would be hard to find a better $8 Merlot from anywhere. This is soft and full-bodied, quite flavorful and fruity, with pretty black cherry fruit. Drinking especially well with a bit of bottle age, it finishes with well-proportioned notes of tobacco and clove. I've found over the years that the Columbia Crest Two Vines Cabernet-Merlot is even better than the straight Merlot. It seems that the mixing of the two varietals create an even more complex and satisfying wine than either the Merlot or Cab by themselves. Wikipedia: "Typically, a Riesling Kabinett from Mosel exhibits a high acidity, with floral aromas, and often hints of slate and minerality. In cooler regions, semi-sweet Kabinett wines have an alcohol content of around 7-8% ABV and dry Kabinett wines are usually around 10-11% ABV. When made in other regions, or from other grape varieties, this can vary." So what is it that I got wrong?